This has been an excellent year for Sporadic-E in 2018, much better than for some time. Openings started here in IO84 square in May on the 50 MHz band (50.313 FT8) and have also been on 70 MHz (70.154 FT8) too. 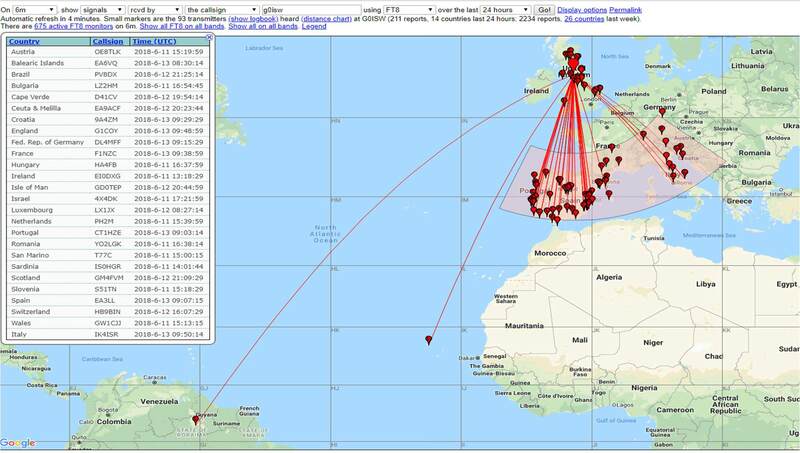 The new FT8 data mode used with WSJT-X software and JT-AlertX and DXKeeper logging has been fantastic for VHF DX chasing. Very easy and quick to automatically be alerted in the shack, house or garden to needed stations whilst ignoring anything else. Weak signals from single or double hop Sporadic-E are easy to work and my humble antennas of a loop for 50 MHz and a Colinear for 70 MHz, both only 2m AGL hidden in garden bushes due to a no visible antennas restriction have allowed me to work many new DXCC Countries and squares on both bands. Single, Double-hop and even Triple-hop Sporadic-E to South America have been observed in the past 24 hours. On the subject of DXKeeper logging it syncs perfectly with the other software mentioned above to automatically upload contacts to both E-QSL and LoTW, a really nice way to do everything without time consuming manual input.